Next to the Crystal, Toronto could be getting a grand new golden box. The University of Toronto has submitted plans to the city for a new building just south of the Royal Ontario Museum, where the old McLaughlin Planetarium now stands. And while it’s a university building, containing a Tetris stack of classrooms and offices, the architecture by Diller Scofidio + Renfro will be bold and weird enough to put its mark on the city – and make a case for high architecture. The nine-level structure is, in the early drawings, wrapped in glass, metal and brick that all glitter in shades of gold. If approved, the building would rise on a crowded site next to the museum, in front of the university’s main music building and next to its law school. It would contain a 250-seat recital hall, an “urban lab” for public events and more, all stacked up along a staircase that slices diagonally upward to the sky. The 15,700-square-metre centre would house a collection of academic programs: among them history, music, law, Near and Middle Eastern Civilizations and a home for the new School of Cities. The music department would get a new 250-seat recital hall on the sixth floor – with windows behind the stage framing a million-dollar skyline view. When you have a crowd of different stakeholders bringing their own wish lists, the resulting building can be a mess. But the architecture by DS+R, along with Toronto firm architectsAlliance, turns such office politics into sculptural weirdness. Offices, classrooms and event spaces are gathered around a staircase – which, in a signature DS+R move, does some strutting as it cuts back and forth and slants upward through the building. The landings – also next to the elevators – are meant to be social places for colleagues and students. Offices, classrooms and event spaces are gathered around a staircase. The landings – also next to the elevators – are meant to be social places for colleagues and students. This is the kind of spatial play at which DS+R excels. The office, founded in the early 1980s, has evolved from the theoretical practice of two academics into one of North America’s most prominent design firms. They partly designed The High Line in New York, the new Broad Museum in Los Angeles and The Shed, a cross-disciplinary cultural institution scheduled to open in Manhattan this spring (it features a giant outer skin that can slide open, on rails, to engulf an adjacent plaza and double its size). The answer: to break the building design into two parts. One end, to the north, is a box, with flat sides of gold-hued glass and glimmering metal. This simplicity of form plays into modern convention – or, if you prefer, straitlaced Toronto staidness. But the other end, to the south, is something else: the building crumbles apart into a set of layers, “eroding,” as Mr. Renfro puts it, to wind its way around a neighbouring building. That neighbour is a meandering 1902 Tudor mansion by Toronto architects Sproatt & Rolph, now part of the university’s faculty of law. “Its quirkiness was part of the inspiration for our quirkiness,” Mr. Renfro said, in explaining the new building’s irregular form. In truth this was likely shaped by the preferences of heritage planners. But in any case, the house will be preserved in full. The old planetarium will not. And while it closed to the public in 1995, the mothballed 1968 building has its defenders. An online petition started by architecture professor Jeff Balmer has 11,000 signatures. I suspect many of those people aren’t in love with the crisp architecture by Toronto’s Allward & Gouinlock. They’re probably thinking back to childhood experiences of the wonder of space. Or, perhaps, teenage experiences of other wonders. Twenty-five years ago, Toronto youths could go to the McLaughlin Planetarium at night and look high to the heavens. There were laser light shows – Laser Floyd: Dark Side of the Moon, Laser Depeche Mode and Laser Zeppelin. The memories of those days may be a little murky, but people hold them dear. And fair enough. But heritage preservation is always about tradeoffs. An old planetarium is difficult to revive; the technology and spatial requirements for this sort of presentation have changed. Vice-president of university operations Scott Mabury says U of T asked its music and astrophysics departments whether they could make use of the space. “It was a no-go,” he said. The good news: The university is planning a new planetarium a few blocks away and will be “actively pursuing a program of engaging with the public,” Dr. Mabury said. 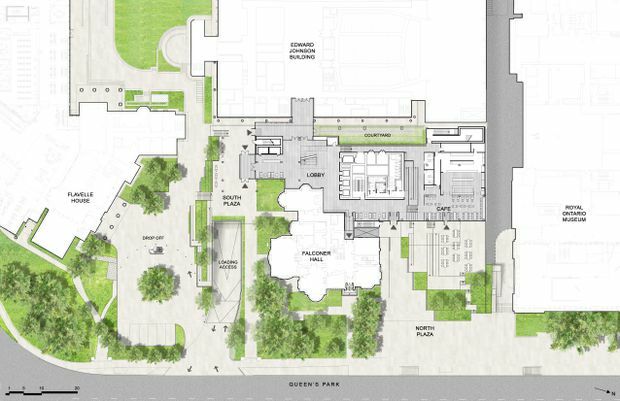 Plans for 90 Queens Park Crescent on the University of Toronto campus. What’s better news for the city, and beyond, is that the university is signalling a commitment to architecture as an intellectual pursuit. Across Canada, the past decade has been a tough time for public buildings, with tight budgets and a heavy reliance on complex public-private partnerships that only a banker could love. U of T, which historically has built some of the finest buildings in the country, has had a mixed record recently. Here, they are aiming high in a very public place. Next door the ROM is among the most important cultural buildings in the country – and its Michael Lee-Chin Crystal addition by Daniel Libeskind is the most contentious piece of architecture of the past 20 years in Canada. The Gardiner Museum of Ceramic Art is across the road. “This is a cultural nexus for the city,” said the University of Toronto’s chief architect, Gilbert Delgado. And it seems the institution now understands its responsibility to contribute to the city. That’s assuming that this design survives, in its peculiarity, through the inevitable slog of budgeting and construction. If so, it’ll be golden. Is Toronto’s public school board spending extra money to tear down an important building?